If you own a Dutch oven, then you probably know how much fun and enjoyment they can be. What’s more is the fact that they are so versatile and durable. And if you use your Dutch oven outdoors this is doubly true. This is where Dutch Oven Equipment comes in. If you use a Dutch oven regularly, you can appreciate any item that will make your cooking experience easier. This is why we will be taking a look at some of the top dutch oven cooking supplies. And the factors to look for in your next outdoor Dutch oven experience. With that said, some of these products might appear to be unusual camp cooking equipment. However, these products are incredibly useful and versatile and were chosen for good reason. So, let’s start with the key factors to look for when choosing your next piece of Dutch oven equipment. When choosing a piece of equipment to enhance your Dutch oven, there are key factors to make note of. For instance, you may need to solve a problem like Dutch oven stability when cooking. Furthermore, you might also need hand protection when handling your outdoor cooking gear. These and more, are all important factors to consider in your next Dutch oven equipment purchase. And in this article, we aim to give you just that. This will hopefully help you to choose the best tool for your specific needs. Whether you’re transporting a scalding Dutch oven or moving around hot coals, hand and arm protection are essential. And this brings us to our top choice, the NoCry Heavy Duty BBQ Gloves. This product is designed specifically to protect your hands and forearms from burns and scratches. Here are some of its key features. 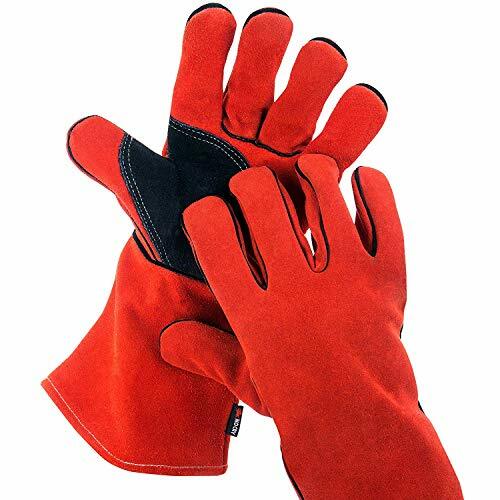 With its strong and long-lasting construction, the NoCry Heavy Duty BBQ Gloves will be a major asset. If you own a large cast iron Dutch oven for outdoor use, you know they can be pretty heavy. Likewise, the lid can be quite hefty as well. This is where having a quality lid lifter would life a lot easier. And the Lodge Camp Dutch Oven Lid Lifter is our top pick for just that task. With that said, here are some of its main features. As you can see, the Lodge Camp Dutch Oven Lid Lifter is a practical piece of outdoor cooking equipment. 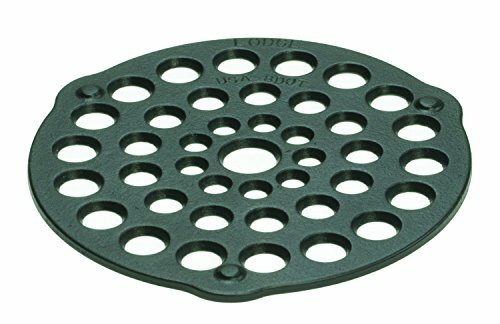 This product will greatly enhance both safety and convenience when lifting heavy and hot Dutch oven lids. When cooking outdoors, it can be a pain to have to constantly stoop down to reach your meals. On top of that, if your having trouble with hot or cold spots, this can be an issue. This problem arises when your Dutch oven is too close or too far from its heat source. This, in turn, makes food preparation more of a chore than an enjoyable experience, as it should be. And this is why our top choice to solve this issue, is the Lodge Camp Dutch Oven Tripod. With this handy tool, you can easily suspend your Dutch oven up off the ground. Furthermore, you can more easily control the distance between it and its heat source. With that, let’s take a look at some great features this product has to offer. With the Lodge Camp Dutch Oven Tripod, you will be able to more effectively reach your Dutch oven. Furthermore, you’ll also be able to better control temperatures and reduce hot and cold areas. When combined with a lid lifter, a lid stand can enhance Dutch oven cooking even more. This product answers the question of, where do I place my lid after it has been removed? And the answer, of course, is a lid sand. This helpful item securely holds your Dutch oven lid, preventing dirt and damage. On top of that, it can also be set into hot coals or wood if necessary to hold Dutch ovens themselves. 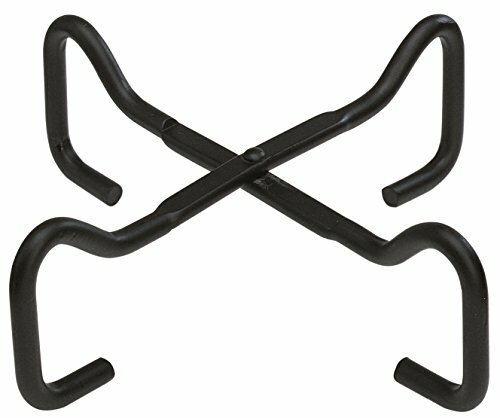 So, what is our top choice for lid stand? Well, it’s the Lodge Original Finish Camp Dutch Oven Lid Stand. This easy-to-use tool makes outdoor Dutch oven cooking, that much more enjoyable. Furthermore, it will easily fold to take up less space and simplify transport. Just take a look at some of the useful features it has to offer. 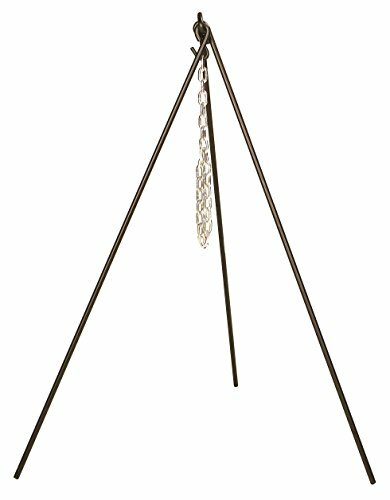 Make the Lodge Original Finish Camp Dutch Oven Lid Stand part of your outdoor cooking tool set. We all know cooking can be extremely messy, but cleanup doesn’t have to be a chore. This is definitely true if you use a CampLiner Disposable Foil DlifesaverLiner. This Dutch oven lifesaver will not only protect your seasoned finish, it will also make cleanup a snap. Whats more is the fact that they are disposable, so cleaning is almost a non-issue. And if you’re having to cook multiple meals, the time it will save is priceless. However, don’t take our word for it, just take a look at some of its great features. 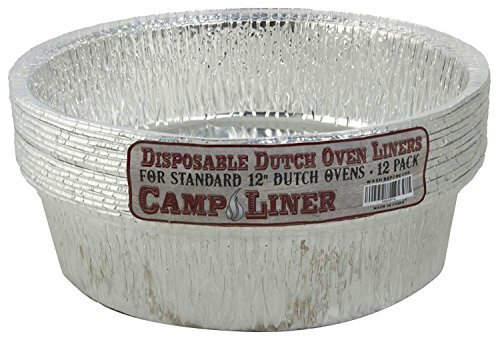 A CampLiner Disposable Foil Dutch Oven Liner will greatly enhance the enjoyment you get from cooking outdoors. Furthermore, you’ll be able to spend more time with family and less time cleaning up after every meal. Whats better than simply cooking in your Dutch oven? How about deep frying in it. And with the Lodge 9-inch Deep Fry Basket, you can do just that. This amazing tool will make short work of any of your outdoor deep frying needs. On that note, explore some of its most noteworthy features down below. 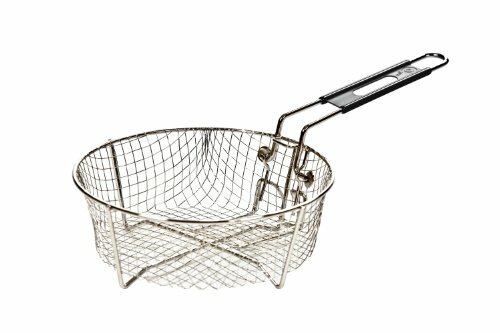 With the Lodge 9-inch Deep Fry Basket, you’ll be on your way to making fantastic deep fried fair-style foods in minutes. Better yet, this product is both easy-to-clean and lightweight. So, you have a lid lifter, lid stand, and foil liners. And you even have a tripod stand to raise your meals up off of the dirt. However, something is missing. And you can’t quite put your finger on it. Where do you place your hot Dutch oven after it’s finished cooking your meals? Well, you use an outdoor Dutch oven table of course. And the Camp Chef Dutch Oven Camp Table is our top pick. This trusty tool will make for a sturdy and clean area to serve all of your hearty outdoor meals. And with features like these, there’s no doubt why this is a top rated and top selling product. As you can see, having a sturdy, stable outdoor table for your Dutch oven is a must. And the Camp Chef Dutch Oven Camp Table is more than ready for the challenge. If you ever have issues igniting charcoal, you definitely need a charcoal starter. 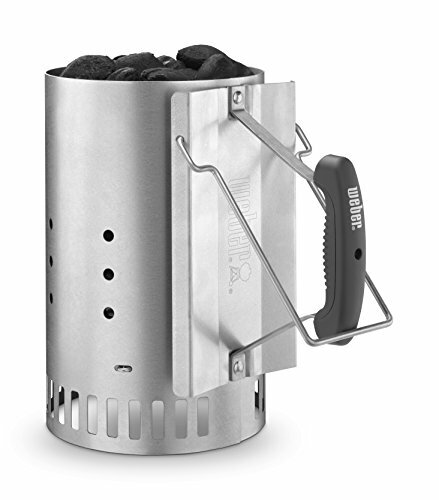 This little miracle will allow you to safely and easily cook with wood stoves, charcoal grills, and fire pits. And with the Weber Rapidfire Chimney Charcoal Starter, you can do just that. Simply place old paper, straw, or any other tinder of your choosing inside the handy igniter chute. Then, light the tinder and drop it down over charcoal or wood to start cooking. And with that, we’ll take a look at some top features that this product has to offer. With all of the hazards that come with outdoor cooking, take the danger out of igniting your charcoal. This product will greatly reduce the chances of getting burned and injured. A Dutch oven meat trivet works in two main ways. First of all, it expertly sears and browns meat, without burning or sticking. Second, it creates a barrier between your food and the cast iron surface of your Dutch oven. This, in turn, allows for easy food removal after cooking is completed. All of this makes the Lodge 8-inch Cast Iron Dutch Oven Meat Trivet all the more needed. This device will be a go-to tool for anyone who is looking to perfectly cook meats and even bake desserts. Don’t believe us? Check out this item’s amazing main features for yourself. In conclusion, the products in this article are our top choices from our 16 Dutch Oven Accessories review article. This article is a more comprehensive list that will contain even more products reviewed than are listed here. With that said, thank you for taking the time to read our review. If you own a plain cast-iron Dutch oven and need tips for cleaning, you can click here. And if you need tips on how to clean an enameled cast-iron Dutch oven, you may click here. Finally, if you are interested in more Dutch oven tools, then visit our article on the 10 Best Dutch Oven Cooking Supplies. Again, thank you very much for viewing our article on the top Dutch oven equipment. We hope you visit us again soon. And as always, please take care.